One morning, after sending Ian to school, and I when I was walking to the bus stop, I happened to look up and saw this very innoculous sight of a cocoon of a worm, being held, perched on a tree branch; swaying gently to the unseen hands of the breeze, a single strand of silk. It was a powerful epiphany. We humans are too safe. It is a worm, in the safe embrace of the cocoon, held only by a single strand of silk, if that silk breaks, the cocoon will fall onto the road, and the probably of being squashed by a car is well, higher than if the cocoon is higher up and away from the ground. Does the worm knows that its life, it’s very existence and its entire universe is depending on that single strand? And that single strand is made by no one else other than by its own resources and manufacturing capabilities? If it had known about its own vulnerability, wouldn’t it had made more than one strand? Some kind of back up mechanism. It didn’t cared, because that is the nature of nature. Nature has a way of providing protection, and has a way of taking away the same protection. Too much protection and you will feel too protected, too little, then you will feel that vulnerability. Nature never cared, but nature has always been caring. And nature is never vulnerable, there is an order of things, silently humming behind the background. Nature is always ‘enough’; a single strand of silk is enough. But the human nature, on the other hand is ‘never enough’. We build and we build, and we liken ourselves to nature’s natural hoarders, the squirrels, who store their food for winter. But we humans tends to take things over board, and hoard to the level of selfishness. I hope I can make you boys see that in life you can never be too safe. Sometimes, there is never enough time for 2 strands of silk, sometime one is all you get and you go with what you got. 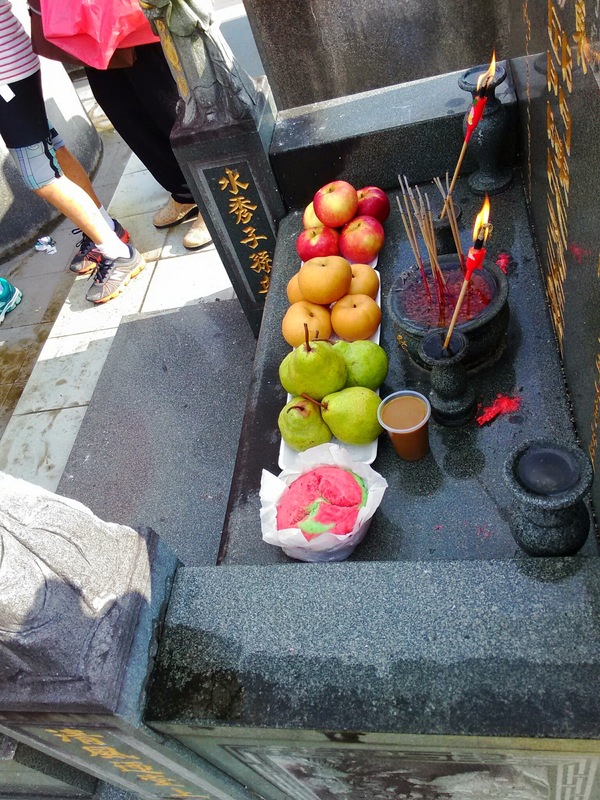 We went for our annual 清明 (http://en.wikipedia.org/wiki/Qingming_Festival) on Friday and this time, we squeezed into your uncle’s Honda Civic and made our way to the first stop, which was ChoaChu Kang cemetery. It was a messy place for the uninitiated, but there is a level of organized chaos. 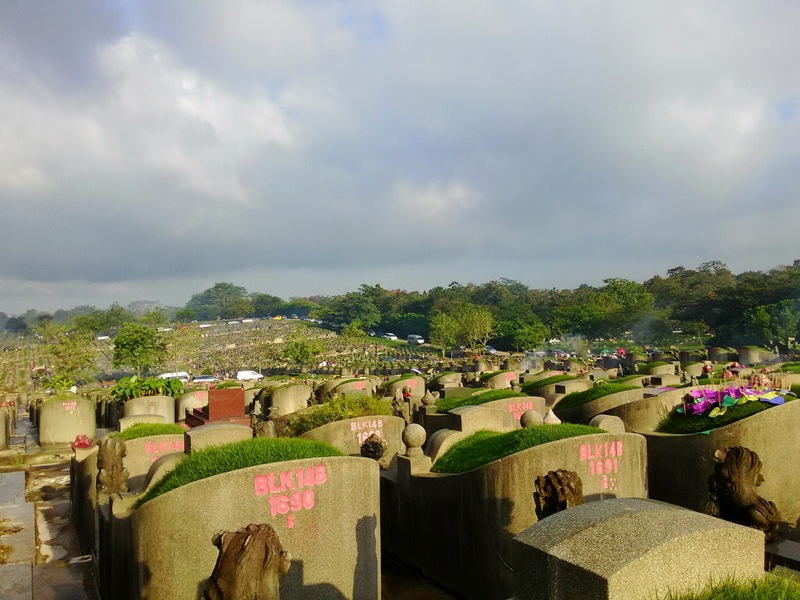 The place is quite massive, with rows upon rows of tombstones and graves, all tightly packed together. Your uncle U-Wei is an excellent navigator, and in no time we found our way there, last year, was a different matter, we have to circle a few rounds as your Ah Gong got the location wrong, no thanks to the confusion and crowds which descend upon that place annually for 清明. 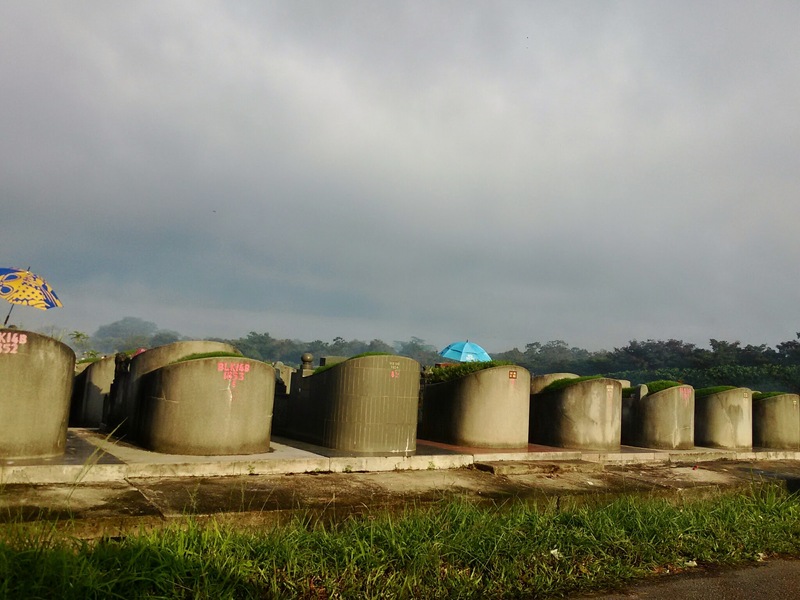 Along the way, we listen to your Ah Ma tells us her 清明 experience, where she went with her dad on a pick up truck to a cemetery in Changi, the place has long been exhumed to make way for the living. 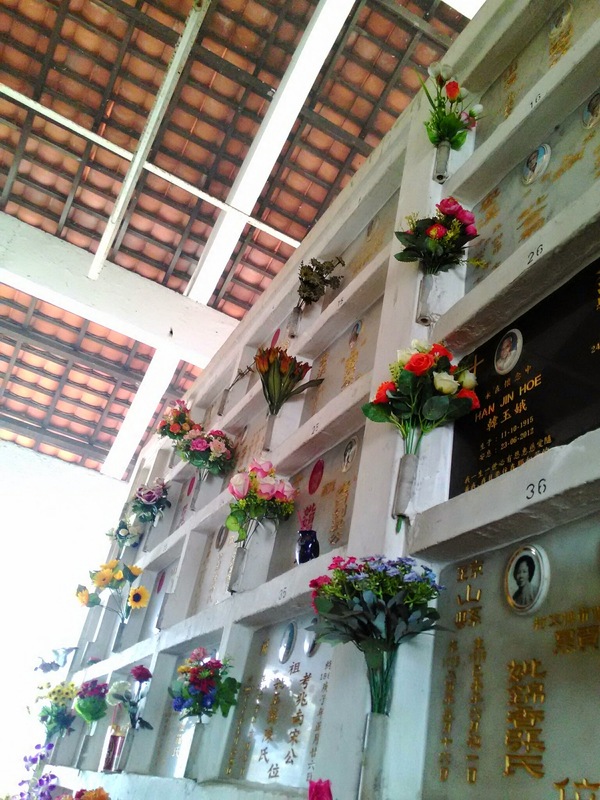 She told us that Changi cemetery was even messier, and they have to walk over other people’s tomb. 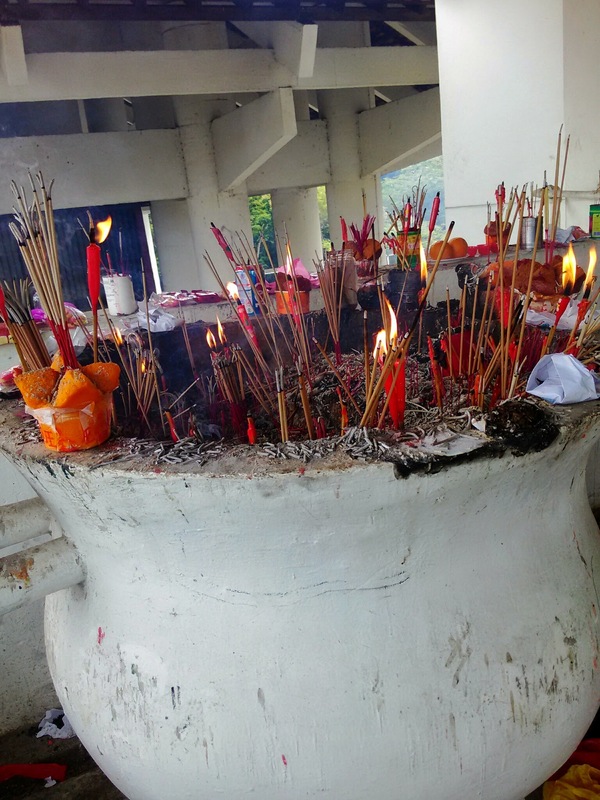 As Ah Ma’s dad will always do their 清明 in the evening, Ah Ma will always stay in the pick up to take care of her youngest brother, while her dad, with her eldest sis and 3rd sis will go and do theit 清明 ritual. 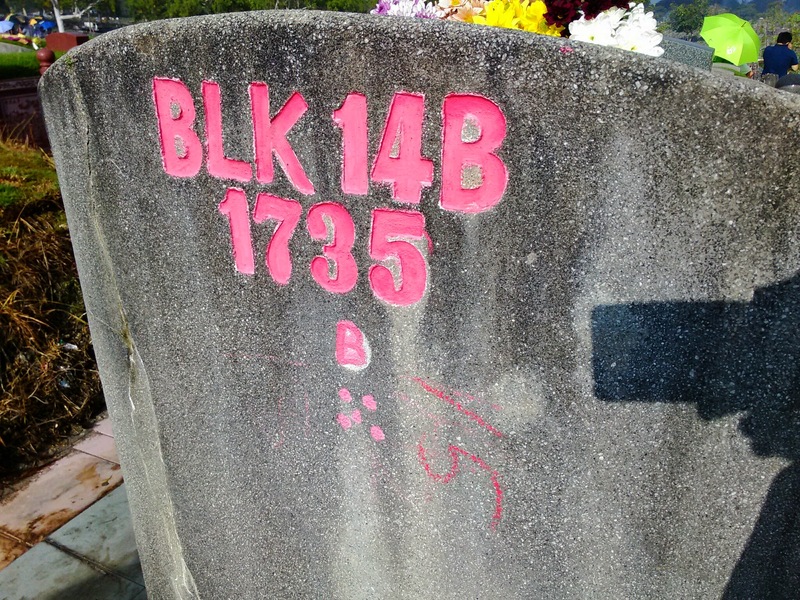 You Ah Ma’s eldest sis, will always repaint the Chinese engravings on the tombstone as it will always fade off, due to being exposed to the elements. Her mum’s tombstone, was a lot larger and ‘spacious’ compared to the current one. The one in Choa Chu Kang lies your Ah Gong’s mother, which is your mum’s Ah Ma, from what I know, she has always been nice to your mum. I didn’t have a chance to see her as she died in 1995, which would made this her 20th anniversary. Oh my, this year, the traffic jam was bad, up to almost 2 hours long, you both had a good long sleep in the car, me included! When we finally reach there, we were quite lucky to find a lot, all thanks to Ah Gong’s sharp eye for a good car park lot. we parked the care without much hassle and headed to our descendants’ duties. It was quite a massive place, where all the urns are place in niches. 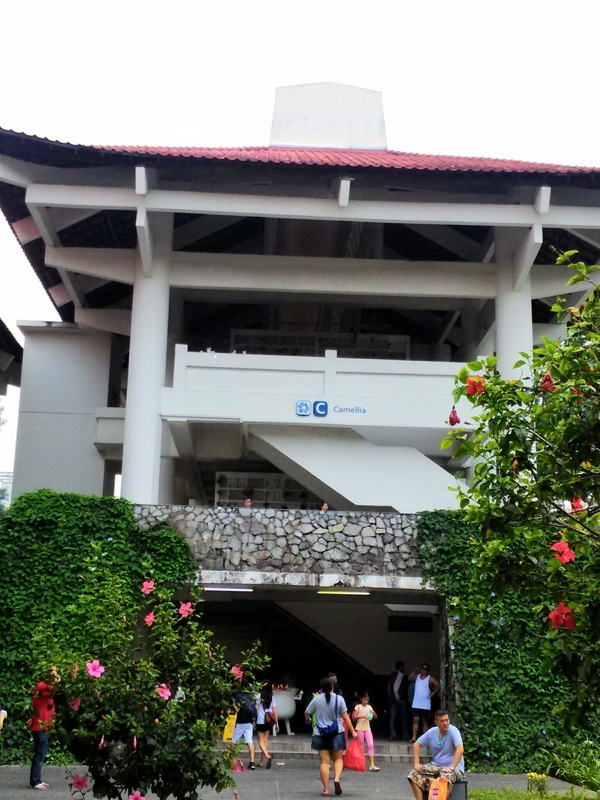 Your Great granddad’s urn is placed in ‘Camelia’, row 315. which means it is on the third floor, which mean 3 flights of stairs, for your Ah Gong, who recently had a knee operations. 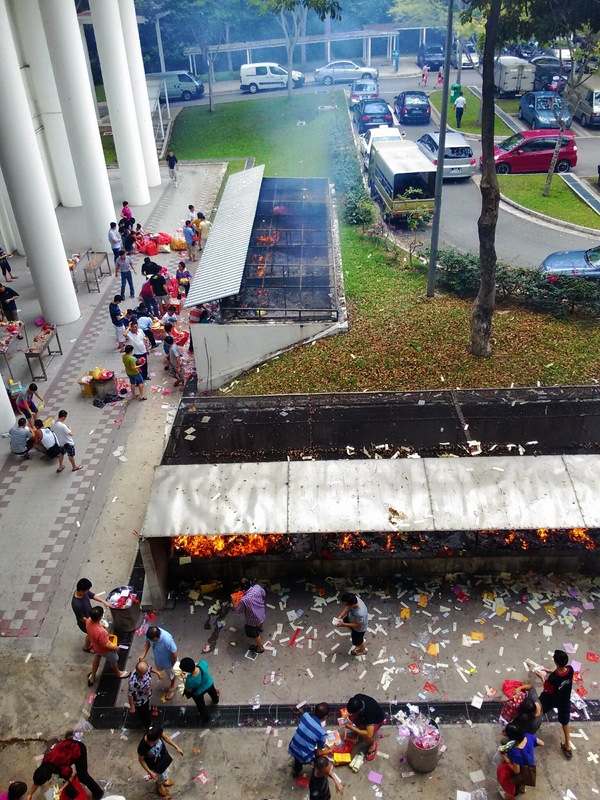 good folks burning their offerings to their ancestors, all the heat, smoke and ashes, were all trapped on the third, topmost floor! 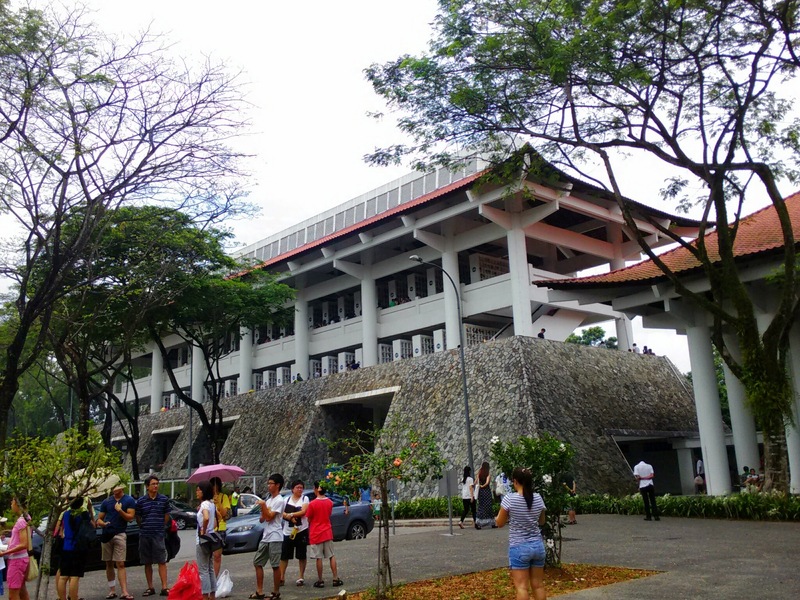 The columbarium was more unbearable, the ashes got into every part of our hair, cloths and nostrils, the smoke irritated our eyes and throat, the trapped heat was unbearable, despite of all that we still have to make it, pay our respects, for without our ancestors, we will not have today. They may be long dead, but as far as we can help it, we have to go and do our due diligence. 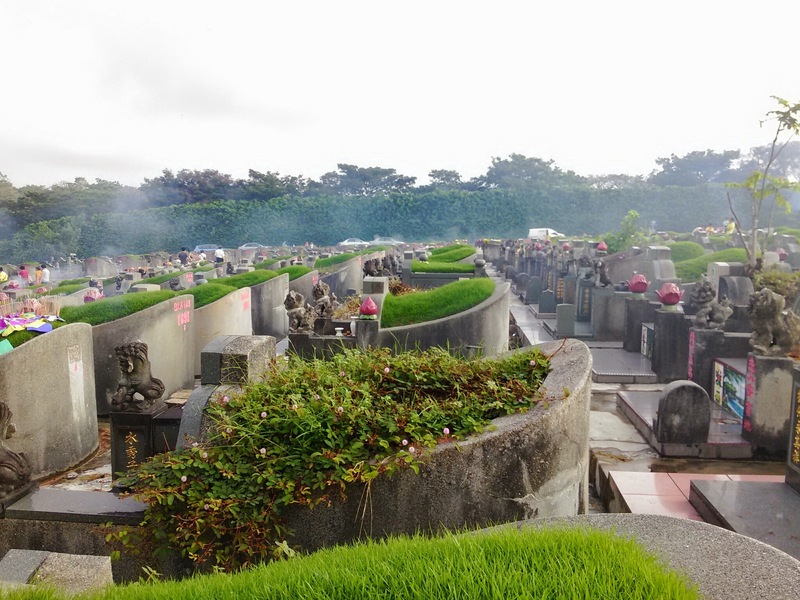 This is what 清明節 is all about, while we continue to build our new, and look into our future, we still have to remember our past, we have to remember those people who are dead, who made choices in their lives then, so that we can have what we have today. This annual ritual of cleaning the tombstone, and making our rather arduous trips to far fetched lands to see the tombstone, and the niches, right now, the both of you are too young to understand. By the time you both are old enough, I hope you can see the value of 清明節 and continue acknowledging our forefathers while you surge ahead into the future. I was sharing this with Gabriel and Zarine one evening, about the attire we wear. I realised that my foundation years in Aikido, I did a lot of suwari waza, or knee walk. Knowing how to fall properly is all about protecting ourselves from greater harm. Extensive practice in knee walks, can be a boon or bane for Aikdiokas. I know some Aikido Shihans who have their knees destroyed by suwari waza. Personally for me, during my peaks, i can knee walk until there are holes on the pants where the knees comes into contact with the mat. Yes, blisters are also quite common. It certainly helps in the stability department. practice on the suwari waza will strengthens the legs and hips, all vital structures for stability in movement or otherwise. Another very important practice is ukemi. Well what are the chances of us using irimi nage in real life? or applying a nikkyo lock? But when is comes to falling, the chances are plenty. Knowing how to fall properly is all about protecting ourselves from greater harm. When I was a motorcyclist, it had saved me from being seriously injured in a accident. Even in reality, falls are never picture perfect like in Aikido, but knowing how to and being experienced in rolling helps us prepare for the unexpected. Your dad recently finished a book called The Boys of ’67: Charlie Company’s War in Vietnam by Andrew Wiest. I won’t go into the book in specific but more about what I learned reading it, from the perspective as a dad. A lot of the men (boys for some!) went to the war in Vietnam as new husbands, dads-to-be and some already dads themselves. The unit, Charlie Company, were a tight groups, as they were recruited from the inception of the unit. Charlie Company didn’t existed prior to the men coming together. Many of them didn’t make it back, those who did, came back maimed, for life. A lot of these men who died, left behind young wives, and children, some who has never seen their dad. They were born while their dads were in Vietnam, and died in Vietnam. The war they fought in the Mekong Delta was horrible, and in one battle, their sister company Alpha, suffered more than 80% casualty. When the war ended and the men of Charlie Company came back to America, they were left to pick up the pieces, many couldn’t. Many suffered PTSD, some rose to the occasion and made good their life. They have seen many horrible things in Vietnam, and watched many of their friends die, many times in their hands. Those who came back were haunted by the memories of fighting for their lives in a war their country wants to forget. Many split and went their ways, trying to get on with lives. They couldn’t. Eventually, they found solace in each other, in their annual reunion where all the veterans of Charlie Company comes together and talked about their old war stories, catch up with their lives. It is in each other’s company that they find a way out of the nightmare, they all collectively shared. for many of them, it was the only therapy that works. More importantly, the gathering is also for the next-of-kins for the men who were killed in Vietnam. Many of the dead soldier’s spouse lived in the painful memory of their dead husbands, love was never given a chance to continue, they are left with the sons and daughters who will never see their dads again. The gathering helped these children close the gaps in their memories, through their dead father’s comrades, these children learned about their dad’s bravery and sacrifice. And learned about the dad they never knew. One very spirited solider was an officer by the name of Lt Jack Benedick, he lost both his legs to booby traps but he didn’t lose his spirit. ( He died in March 2013) He went on to become a champion skier and even won medals in Para Olympics. More importantly, what inspired me was this part of the book. He may have lost his legs, but he didn’t lose his memory of walking. And if he fell, he didn’t forget about getting back up either. This to me is an awesome attitude. He didn’t blame anyone, he didn’t wallow in self pity, he lost his legs and he gained a lot more. I couldn’t help but think how many of us, able-bodied, but mentally handicapped, and helpless. We allow circumstances and situations get better of us, and allow us to become smaller than our predicament. We didn’t fight. I ended the book with a lot of thoughts, these men came back from a horrible episodes, trying to be fathers and husbands again, learning to assimilate back to civilian life, and only found peace with the men they fought together in Vietnam. Those dead soldier’s children can only learned about their dad from these men. I can’t help but think, when I die, you boys are fortunate to have spent so much time with me, and know me so well, as your father, and as your mother’s husband. We will become your memories one day and I hope we have ‘downloaded’ enough for the both of you to remember us when we are no longer around.